Even the safest of drivers must be prepared for any roadway scenario. No matter the weather conditions, you cannot predict how your car or other drivers on the road will perform. Car troubles and other emergencies happen, and it’s crucial to keep important items in your car that are valuable in these situations. The trunk of your car is a great storage space for emergency items and car repair essentials. The experts at CarRegistrationAdvisors.org know it can be frustrating when you are stranded on the side of the road, so make sure to always have these four items in your trunk to be prepared. This item is essential for almost every winter driver. Whether you live in a location that experiences harsh winters or you only get a dusting a few times a year, an ice scraper is undoubtedly useful. No one enjoys wiping snow or ice off by-hand. If you keep this useful tool in the trunk of your car, you will always have it, especially when you least expect you will need it. The weather is unpredictable, but you can be prepared and ready to drive. A flat tire is enough to put a damper on anyone’s day. The team at CarRegistrationAdvisors.org knows it can be especially frustrating if you must wait for a roadside service or a friend to come help you. Keeping a spare in the trunk of your car will allow you to always be ready in case of a flat tire. There is usually a compartment in the trunk of your car where the spare is kept, and it is important to keep a tire jack and a tire iron in your trunk so you can change the tire. If you don’t know how to change a tire on your own, there are many tutorials online that can easily teach you. A dead battery can leave you stranded at the most inconvenient time. It can leave you helpless and waiting for a roadside service. 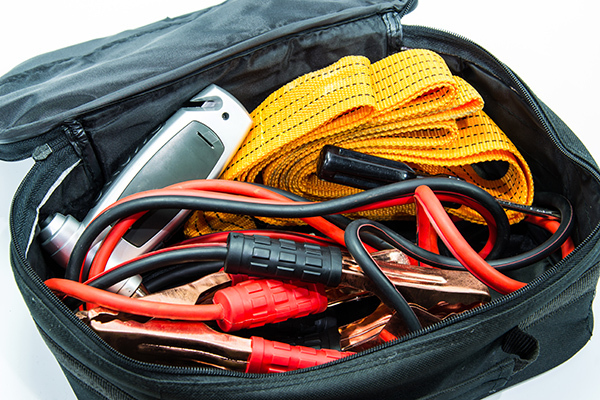 The experts at CarRegistrationAdvisors.org recommend keeping a set of jumper cables in your trunk in case you ever need to jump-start your car. You could always ask another driver nearby to help you jump-start your car, and if you already have the jumper cables, you are one step ahead. With the assistance of another motorist, you can be back on the road in no time. Driving a vehicle is a huge responsibility, and every motorist should be prepared for a medical emergency. A first-aid kit should always be in your trunk if an emergency arises. You can buy a pre-made kit at the store or prepare your own. It should contain sterile gauze, adhesive bandages, an elastic bandage, a splint, adhesive tape, antiseptic wipes and rubber gloves. Pre-made first-aid kits come with a manual with instructions on how to dress a wound. The team of experts at CarRegistrationAdvisors.org knows that keeping a first-aid kit in your car can prepare you for anything that comes your way.